Great news! You will receive everything necessary to pass the core aspects of your exam. Immediate 90 Day Access to All Exam Prep Material. Updated for the 2019 Real Estate Exams. 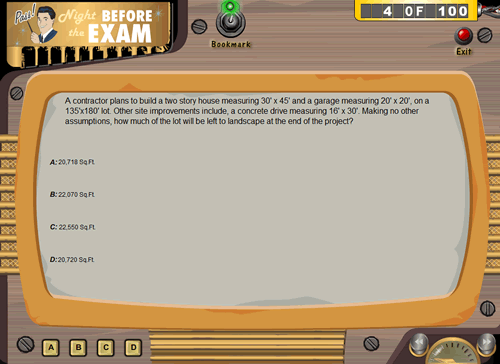 Real Exam Simulations from Large Database of Questions. Bookmark Tough Questions. Easily Revisit and Learn. Detailed Explanations Teach You What You Need To Know. Heavy Emphasis on Math With Step-by-Step Instruction. Saves You Time. Self Adjusts to Your Current Skill Level. Allows Custom Adjusting of The Cram Sessions. Predicts Your Likelihood of Passing with Competency Meters. One-of-a-Kind Method Helps You Study Smart & Efficiently. Works Over Your Internet Connection (no installation). Study From Virtually Any Location (work, Office, etc.). "What if I could use my limited time efficiently and study faster?" 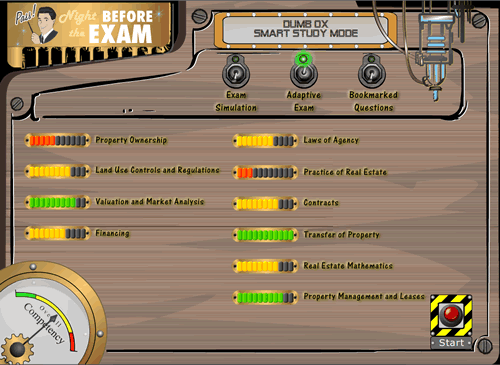 Our intelligent Dumb Ox Real Estate Exam Prep Engine will analyze and identify your strengths and weaknesses WHILE YOU STUDY! Our advanced learning system will then use that data to dynamically adjust and customize your study sessions for maximum time and retention effectiveness. "I wish I could study from my weak areas and save time"
We all love choices, and here at NightBeforeTheExam you have it in abundance. 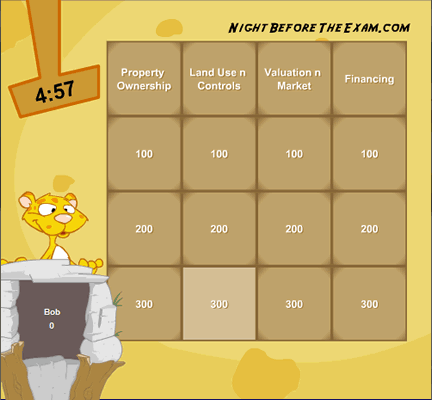 Feel like taking a simulated real estate exam? Done. Only have time for our Exam Engine to throw questions at you based off your weak areas? Done. How about printing out a Cheat Sheet made just for you... Done. "If I only had a study system that was easier to understand." Not only do we know the topics you will be tested on, we also provide easy step-by-step solutions on how to solve the exam questions. Over the last 15+ years we have perfected the art of online studying for common Joes and Janes. Presented in an easy and approachable format. It takes the guess work out of studying. It finds your weak areas. It helps build a solid foundation of understanding. It allows you to study more with less time. It has a Glossary that is written for average Joes n Janes. It creates Cheat Sheets just for you, based on YOUR needs. It works easily from virtually any computer. It not only works, but looks and feels great. It is fun to use. It tracks your knowledge as you learn. It creates confidence in the exam. It is a similar testing format to the real thing. Buy Now and Start Studying Immediately. Real Exam Simulations from a Database of Hundreds of Questions. Adaptive Exams that Automatically Adjust to Your Skill Level. Save Time with our Adjustable Cram Mode. Set to Your Comfort Level. Printable Custom Cheat Sheets Generated Off Your Weak Areas. Easy to Understand Online Glossary. Informative ToonTorial Videos. (Instructional cartoons). Sophisticated Competency Meters Predict Your Passing Likelihood. 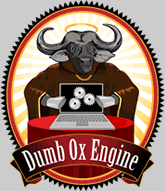 Experience the Thrill of Using the Dumb Ox Exam Engine! Are You Preparing To Take and Pass the Real Estate Exam? For years (since the 90s) we have been providing unique, cutting edge real estate exam preparation. Our proven study methods resulted in success for thousands. We have powerful test prep tools, especially if you are short on time. Our proprietary "competency meter" algorithms have been finely tuned after years of use by thousands. We are constantly adding features and content for our customers. Access begins the moment you purchase. 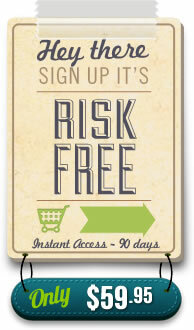 100% Risk Free and priced to get your attention. 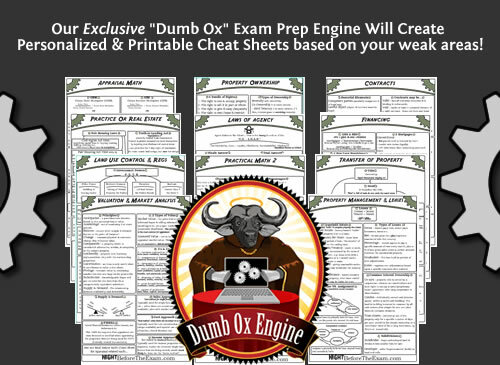 The Dumb Ox Exam Prep Learning System is unmatched in features, yet super simple to use. Get access to not only the best Exam Prep, but also our awesome educational games and Cheat Sheets. Grab a cup of coffee and Start Studying Now!